Be it weight loss or desire for good health, drinking water regularly and in right amounts is the best way to release the unhealthy toxins in your body. Drinking 6-8 glasses of water daily will not only keep your hydration level high but also maintain the health of your vital organs. To increase the health benefits, adding a few nutrients is a great idea. Here are a few formulae that you can try with water to gift yourself a healthier lifestyle. Process: Add ginger to water in a saucepan and heat it to boil. Reduce the heat from high to low; let it simmer for 15 minutes. Strain and drink it. Health Benefits: This ginger water reduces indigestion, menstrual cramps, nausea, gas, and vomiting related with different conditions. Consuming ginger water decreases joint swelling, inflammation, and pain in case of rheumatism and osteoarthritis. Process: Shave the cucumber skin and make ½ inch broad alternate bands of bare and peeled cucumber. Remove the ends. Cut the cucumber lengthwise and further into slices of ½ inch each. Put this in a pitcher filled with water, keep it for an hour and put ice while serving it. Health Benefits: There’s a trace mineral and silica in cucumber which keeps the connective tissues healthy. It’s beneficial for both muscles and skin. The antioxidants and silica keep the skin supple and clear. Process: Take some fresh roses with fragrance, clean them and pull of its petals. Discard the leftover. Put the petals in a pan and pour water over it. Heat the water on a low flame and cover the pan by using a lid. Use a mason jar to strain out the water in it. Health Benefits: Rosewater maintains the required pH balance as well as oil in the skin. Also, its anti-inflammatory characteristics reduce acne, redness and irritation in skin, eczema, and dermatitis. The same can be sprayed on your hair to increase its smoothness and shine. Process: Put water and rice in a big saucepan. Keep it away for straight 3 hours, then boil it and finally, bring it to low flame for 30 minutes. Let it cool. Run this mixture in a blender till its smooth. Strain it using a thin sieve or cheesecloth. Health Benefits: Mainly, rice water is good for rinsing hair and mixing it with a bit of castile soap turns it into a natural shampoo. It also works as a perfect face toner. It also increases the shine in hair, smoothens skins, and has physical health benefits if consumed directly. Process: Fill a pitcher with water, add mint leaves and slices of lemon and stir it gently. 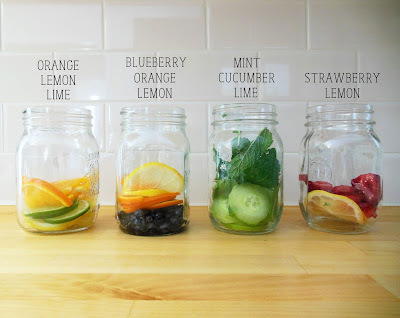 Refrigerate the mixture and stir it once in a day till its flavors have blended for 2-3 days. Health Benefits: Mint promotes digestion and works as a palate cleanser or appetizer. It reduces inflammation and digestion related issues. In case of uneasiness in the stomach, drink mint water to feel relief. Process: In a cup of water add lemon juice. Or to 3 tbsp of boiling water and some cold water add ½ cup of lemon juice. Health Benefits: The presence of Vitamin C (approx. 30-50gms) and potassium in lemons increase immunity in the body. Consume it as the first thing every morning for its best absorption. Process: Boil1 liter of water and put fennel seeds in it. Immediately turn off the heat and cover the pan using a lid. Bring the water to room temperature. Health Benefits: This recipe of water improves issues related to constipation, bloating, indigestion, and bad breath. It also eases menstrual pain. Process: Boil water and pour it in a mug. Once it’s slightly cool, add 1-2 tbsp (15-30 grams, approx.) of honey to it. Stir it to dissolve completely. Health Benefits: Honey water not only helps reduce weight, but also adds to the immunity, decreases allergies, improves sore throat, detoxes the body and eases gastric troubles. These are extremely easy recipes to follow and very beneficial for your health. Do follow them and see the difference yourself.